It is, officially, early autumn, and the russet and gold signs of this are carpeting every lane and verge, while mornings and evenings are perceptibly darkening. But this month the weather has also held us suspended, mid-season, in late summer - even the nights have been relatively mild, with warm days, regardless of sunshine or cloud. The heating is off or turned low, while we spend our time dressed in in-between clothes: not-quite summer, but not-yet autumn; outfits in which coats, jumpers and socks are largely redundant. It has felt like what the writer Robert Macfarlane described on Twitter as an uncanny enclave of summer, deep into autumn. And yet, it is not so uncanny, or so rare. Our mediaeval forbears had a name for this phenomenon: St Luke's little summer, in honour of the saint whose feast falls tomorrow. The evangelist and patron of physicians is also the one who - if tomorrow is still mild - will bless us with a final burst of sunshine and warmth, before autumnal chills and darkness inexorably settle in. But what would those mediaeval folk have made of yesterday? Yesterday, while the disconcertingly gentle-sounding Hurricane Ophelia battered Ireland and the North-West, the rest of us spent the day under a strange, almost apocalyptic sky, while leaves performed a swirling, rustling dance in the suddenly strong winds. Yesterday the sun shone, even from a grey, cloudy sky; huge and haloed and red-gold in the morning, bestowing a warmth which belied the surrounding clouds. By early afternoon, though, London experienced an early twilight: a sickly, sepia, disconcertingly darkening, heavily stilling light akin to the one which usually precedes a heavy storm... but on this occasion didn't. 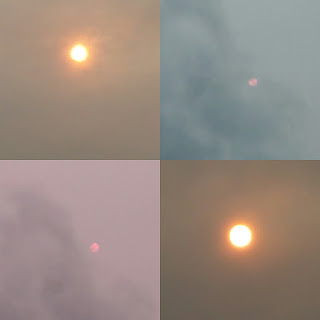 And when the scurrying clouds parted, there, still was the sun; seemingly smaller, no longer gold now, but, weirdly, red.